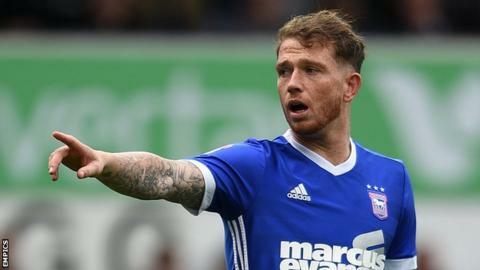 Joe Garner's clever finish and an Adam Matthews own goal condemned Sunderland to a fourth Championship defeat in five games at home to Ipswich. The hosts started well, with Joel Asoro dragging a chance wide, while Martyn Waghorn struck the bar for Ipswich. Striker Garner opened the scoring when he held off Billy Jones, turned in the box and found the bottom corner. Ipswich doubled their lead when Grant Ward's cross went in off Matthews' leg, and Sunderland offered little in reply. Chris Coleman's Black Cats remain second from bottom and two points from safety, while the Tractor Boys stay 12th - above rivals Norwich on goal difference. The home side gave starts to new signings Lee Camp, Ovie Ejaria and Ashley Fletcher, but had the stuffing knocked out of them after falling behind. They might have been handed a lifeline when George Honeyman's cross hit Jonas Knudsen's arm in the box, but referee Darren England waved away penalty appeals. Waghorn, denied by the woodwork from a free-kick in the first half, should have made it 3-0 when he was through on goal and poked wide, but Ipswich did enough to record their first-ever win at the Stadium of Light. "It was the second game running where we conceded a minute before half-time, but it is what it is and we are where we are. "When we go a goal behind, we just don't come back. That's a worry because we're not always going to go 1-0 up. There's only us can change that. "With 25 minutes to go, it's got to be a penalty. Its handball. If he was two or three yards away, you might say he couldn't get his hands out of the way. But that wasn't the case." "I had to change it tactically on the hoof really - their number 53 (Ovie Ejaria) was having a field day and I had to put Cole Skuse on him. "(Grant) Ward and Freddie (Sears) were different class - they've both come in and hadn't been playing a lot of football but they've done it right. They've trained properly and they're ready to go. "They caused us a lot of problems for the first 20 or 30 minutes but I thought after that we were - not in charge of the ball - but in charge of the game." Match ends, Sunderland 0, Ipswich Town 2. Second Half ends, Sunderland 0, Ipswich Town 2. Corner, Sunderland. Conceded by Luke Hyam. Substitution, Ipswich Town. Adam Webster replaces Joe Garner. Corner, Sunderland. Conceded by Jordan Spence. Foul by Ashley Fletcher (Sunderland). Cameron Carter-Vickers (Ipswich Town) wins a free kick in the defensive half. Callum Connolly (Ipswich Town) wins a free kick in the defensive half. Kazenga Lua Lua (Sunderland) wins a free kick on the left wing. Foul by Cameron Carter-Vickers (Ipswich Town). Aiden McGeady (Sunderland) wins a free kick in the defensive half. Substitution, Ipswich Town. Luke Hyam replaces Cole Skuse. Attempt blocked. Stephen Gleeson (Ipswich Town) right footed shot from outside the box is blocked. Attempt blocked. Joe Garner (Ipswich Town) left footed shot from the centre of the box is blocked. Assisted by Callum Connolly. Attempt missed. George Honeyman (Sunderland) right footed shot from outside the box is too high following a corner. Corner, Sunderland. Conceded by Martyn Waghorn. Corner, Sunderland. Conceded by Luke Chambers. Attempt missed. Joe Garner (Ipswich Town) left footed shot from the left side of the box misses to the right. Assisted by Stephen Gleeson following a set piece situation. Callum Connolly (Ipswich Town) wins a free kick in the attacking half. Attempt missed. Martyn Waghorn (Ipswich Town) left footed shot from the centre of the box is close, but misses to the right. Assisted by Joe Garner with a through ball. Substitution, Ipswich Town. Stephen Gleeson replaces Grant Ward. Offside, Ipswich Town. Freddie Sears tries a through ball, but Martyn Waghorn is caught offside. Attempt saved. Kazenga Lua Lua (Sunderland) left footed shot from outside the box is saved in the top left corner. Assisted by George Honeyman with a headed pass. Attempt blocked. Lee Cattermole (Sunderland) right footed shot from outside the box is blocked. Substitution, Sunderland. Aiden McGeady replaces Adam Matthews because of an injury. Delay in match Adam Matthews (Sunderland) because of an injury. Ovie Ejaria (Sunderland) wins a free kick in the defensive half. Grant Ward (Ipswich Town) wins a free kick in the attacking half. Attempt missed. Kazenga Lua Lua (Sunderland) right footed shot from the centre of the box is high and wide to the right following a corner.